New York: Avon Books, 1986. 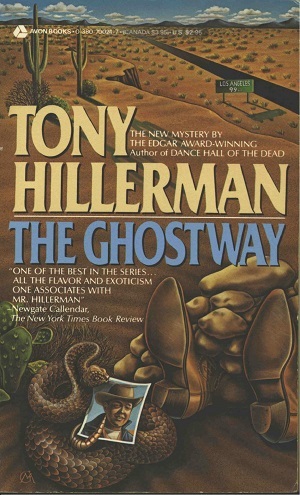 This is the first paperback edition of The Ghostway published in 1986 by Avon Books (now an imprint of HarperCollins). The front cover illustration (unattributed) shows a rattlesnake coiled around a snapshot of a man in a Western-style hat. To the right of the snake, two cowboy boots protrude from a pile of stones. To the left of the snake is a nopal (prickly pear) cactus plant. Overlaid on the drawing are the author's name, printed in tan, and the name of the novel, printed in sky blue. The cover also announces the book as "the new mystery by the Edgar award-winning Author of Dance Hall of the Dead." The back cover is dark teal blue and the heading "A Killing Spirit" is printed at the top in sky blue, above the novel synopsis printed in white. Format: Paperback, 17.3 x 10.5 cm. Binding: Paper covers with full color illustration on front cover; back cover includes detail inset from front cover.